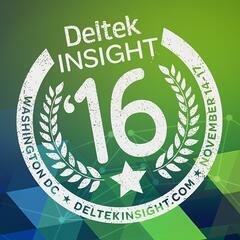 This year’s Deltek Insight Conference is in Washington, D.C., from November 14th to 17th. Are you still undecided about attending? If you’ve never heard of Deltek Insight, no problem! Here’s a quick rundown of the information you need to know about Deltek Insight 2016. Attending sessions at Deltek Insight is a great way to have that “aha” moment. Especially when you realize Deltek Vision can do more than you ever thought. Whether you are rookie user or are a Vision power user, there are sessions for you. Why should you attend sessions? Sessions are expert-led classes by peers designed to provide Vision users with continuing education so they can further harness the power of Vision. Additionally, experts from Full Sail Partners will lead several sessions. Do you understand how to use Vision Marketing Campaigns? Join our client Karen Crilly from BG Buildingworks and our very own Graham Gardner as they review the fundamentals and best practices of Vision Marketing Campaigns. Are you curious about using Vision’s Approval Engine? Kelly Duquette will cover five critical areas you need to know before you start. Check out the whole list of Full Sail Partners led sessions here. Let’s take a minute for some self-reflection. Do you find yourself thinking about Deltek Vision when you’re not at work? Have you found yourself chatting away about Deltek Vision with people who don’t share the same amount of enthusiasm? Wish you could find others firms like yours somewhere else in the country? If you answered yes to any of these questions, Insight is the place you need to be! Insight provides a prime environment to meet and network with Vision users from across the United States. At Insight, you can hang out with other like-minded Vision geeks to share tips and tricks, and to have a great time. Deltek Insight will begin Monday night with a welcome reception in the expo hall. At the welcome reception, Insight attendees are able to mingle with other attendees and learn more about the planned events and projects for Insight 2016. Additionally, Deltek organizes a charity project each year for Insight. This year’s charity project will involve the assembly of toiletry kits that Operation Gratitude can include in their care packages that are sent to deployed troops, veterans, new recruits, first responders, and Wounded Warriors. You can volunteer to help during the welcome reception. The welcome reception also provides a great place to meet with your Deltek partner. Make sure you stop by our booth in the expo hall during the reception and find out what we are doing to make Vision better! After several days of Deltek Vision information overload, Insight concludes with an exciting party and live concert. Celebrate Insight is on the Wednesday night of Insight and kicks-off with a variety of food and dessert stations. After you have filled yourself with all you can eat, the entertainment begins. If you have been to previous Insight’s, it should be no surprise to you that the Deltek house band, LoCash, will be headlining the night. Before LoCash takes the stage, enjoy a jam session with the lead signers of Sugar Ray, Tonic, and Better Than Ezra. Don’t miss out on the most exciting A/E conference of the year!